Jurgen Klinsmann’s first CONCACAF away game wasn’t terribly pleasing to the eye. The Americans dominated possession but created few opportunities, and fans were subjected to a Guatemalan attack that did little but punt the ball forward. The lack of final third quality from either team made the draw a fair result. With Fabian Johnson back in the fold, Klinsmann’s toughest decision was how to replace the dinged up José Torres. He used the Bradley/Edu/Jones midfield triumvirate but not in a way we’d seen before. Jermaine Jones was fielded as the right midfielder, creating a staid 4-4-1-1/4-2-3-1. 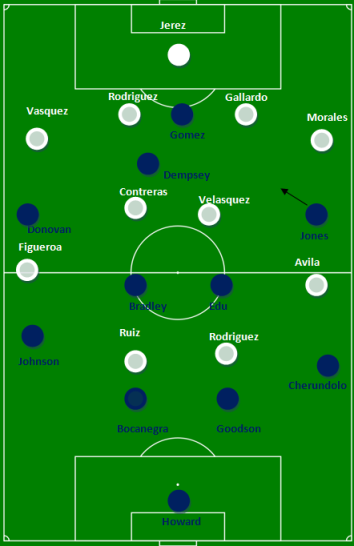 Without a true creative player on the right side – and the Guatemalans in a very defensive 4-4-2 – the US attack suffered. Guatemala's 4-4-2 coped well with the US attack, though much of that had to do with a lack of movement from USA's front four. Jones didn’t exactly look uncomfortable on the flank, as he often ventured inward to attempt to link with withdrawn forward Clint Dempsey, but Jones wasn’t terribly successful in his efforts. Considering he’s a defensive midfielder by trade, his performance can’t be criticized too much (that’s not to say the same of Klinsmann’s choice to put him out there). The knock-on effect of his positioning was that Landon Donovan moved to the left. When Dempsey plays on that wing, he spends just as much time in central areas as he does out wide. Donovan, however, stayed much closer to the touchline than Dempsey normally does, which gave Fabian Johnson less room to work in. It’s telling that Steve Cherundolo, who had more space since Jones was coming inside, attempted 14 more passes than Johnson. On the few occasions Johnson managed to get into the final third, the attack prospered. Though with Donovan taking up so much space, Johnson struggled to influence the match with regularity. If there was one positive to Jones being an outside mid, it was that Dempsey was pushed higher. However, Fulham’s leading man rarely provided dangerous service or looked likely to score himself. His positioning was fortuitous in the 40th minute, though, as he was at the top of the box when Johnson produced one of his rare runs forward. The goal, which included Dempsey skipping past two defenders along the edge of the box, occurred when Donovan moved inside of Johnson, though the pair admittedly benefited from a deflected pass that bounced into Johnson’s path. That sequence was not a regular sight, though. For long stretches the US pinged the ball horizontally around the edge of the final third. The team simply wasn’t creating enough off the ball support. There were very few diagonal runs into the final third, which left Dempsey and Michael Bradley without anyone to pass to in dangerous positions. The Jones/Donovan outside dynamic, despite decent performances from both players, sucked all the life out of the attack. At the back, defending most often consisted of chasing down long punts from the Guatemalan goalkeeper or backline. The hosts rarely tried to play the ball forward through the feet of their attackers. The strategy was something of an odd choice given the American’s struggles to defend when the Guatemalans worked the ball up the field. Fortunately for Klinsmann’s defense, they didn’t have to cope with many ground-based attacks. Instead the home side sent pass after pass over the top. It’s hard to recall another recent match where so many balls were punted up the pitch. 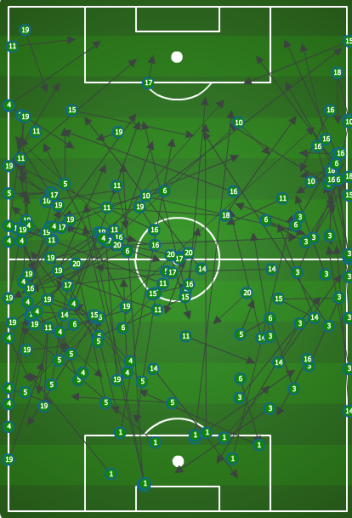 Guatemala's completed passes show how much they relied on long balls. It was not pretty to watch. Eventually the strategy paid off. Carlos Bocanegra misread a booted ball from the goalkeeper and had to watch it bounce over his head to Carlos Ruiz. Johnson wisely squirted over to cover for Bocanegra only to overplay Ruiz and commit a foul; Marco Pappa’s excellently taken free kick froze Tim Howard. USA’s Number 1 read the shot well initially but for some reason didn’t take a stab at blocking it. The Guatemalan’s strategy may have been infantile, but they did produce twice as many shots on target as the USA (4 to 2), further proof that the US needed more guile up front. Any away point in World Cup qualifying, even against relative minnows like Guatemala, is precious. But Klinsmann can’t be happy with the way this one was earned. In some ways, he has only himself to blame. His roster included 4 holding midfielders and 4 traditional forwards. A gimpy Torres left him with little alternative in attack. When the next round of qualifying starts in the early fall, Klinsmann needs to bring more creative players into the fold. Gringos, what did you think of this one? Did you consider switching over to the NBA Finals once Guatemala’s attack pattern became clear? Could Jones have done any better on the flank, or was the flimsy US attack all Klinsmann’s fault? Thought experiment: would have been a great game to see Shea on the left, which would have allowed Donovan to stay on the right side and work with Deuce. Hopefully Brek can get his form back for a call-up the next round. Why ask Jones to play right mid, an unfamiliar position in a hostile environment? Why then force Donovan to the left? Klinsmann has been displaying a flare for the stupid lately, and this is rather concerning. I am now beginning to understand why Low is Germany’s head coach. Also found in aisle #1 in the stupid department, why are Jones and Gomez (and Donovan at times) taking set pieces when you have the proven Bradley available? The quality of his set piece deliveries for Chievo (where he is the primary) was undeniable, and arguably better than Landon’s. The free kicks by Jones and Gomez were totally wasteful and embarrassing. To throw opportunities like that away in a WC qualifier is astonishing. 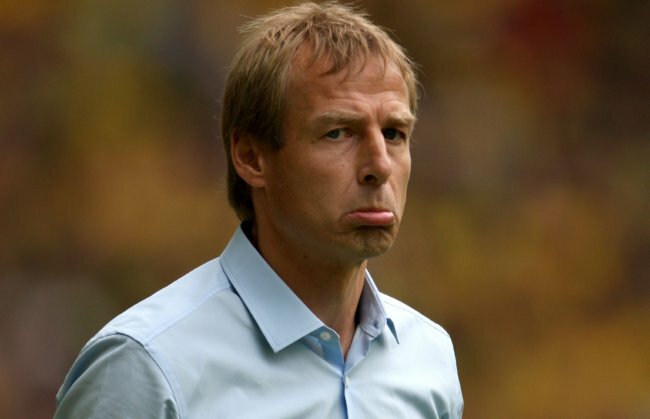 As you can surmise, I am not impressed by Klinsmann’s efforts over the past month. He fatigued his team by essentially playing the same players in the first three “meaningless” friendlies, he played players needlessly out of position, he failed to call up players that could have reinforced the style of play he seems to be demanding (Lichaj, Shea), and this ridiculousness on set pieces is just about unforgivable. I’m not calling for his head, but the last three games have been real puzzlers. He’s making mistakes I would expect from a novice, not a Juergen Klinsmann. Moving Donovan to the left was the big head scratcher for me. I thought we were going to see a 4-3-3 when the lineups were announced, and it took my brain about 20 minutes to wrap around the fact that Donovan was permanently on the left and Jones permanently on the right. You’re a bit harsher than I am, but I don’t blame you for it. Klinsmann didn’t earn a big vote of confidence the last 3 weeks. I could be too harsh. My problem is I don’t mind experimentation if I can divine the logic, but it annoys me to no end when I can’t. Case it point, Torres at left back. What, if anything, would suggest that Torres could play left back? Does he play there for his club? Does his style suggest he can defend and then push forward? I believe those answers are an obvious “no”. In fact, if you just watch Torres’ game, he is a classic holding midfielder. He neither possesses the physicality of a destroyer, nor does he have the forward impetus of an attacking mid (which also hurts him when he’s positioned out wide as a left mid). His technical abilities allow him to do one thing – recyle possession (he is a very poor man’s Luka Modric). His passes tend to go backward as much as forward, but your side will have a slightly better possession number with him involved. Put him in an position where you want him to drive forward and attack, or place him in spot where he needs to defend and cover and you are simply asking for too much. Klinsmann should know this. Does he think Torres can learn left back – if so, then friendlies are the time to experiment -not World Cup qualifiers (even if against the minnows). He had Parkhurst available; that was the move to make. Where was the logic to playing Torres there? Did we really need to take that risk against Antigua & Barbuda, to have a left back that might connect a pass a little better?